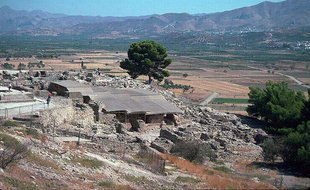 Festos is the second largest Minoan palace after Knossos and has a majestic location overlooking the Mesara Plain . To the west the palace views the imposing Mount Psiloritis. Myths claim that Radamanthis, brother of Minos, founded and ruled Festos. It was an important religious, administrative and economic centre during Minoan times. During the Archaic, Classical and Hellenistic periods, Festos was independent, but its previous status was greatly decreased. The city state was defeated in 220 A.D. by Gortyn and destroyed. 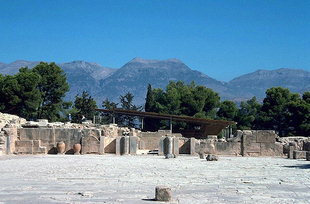 The first palace, built here around 1900 B.C., was destroyed by an earthquake in 1700 B.C. Afterward, the palace was rebuilt on a grander scale and this second construction is what is seen today.